Nov. 13, 2012 — Transcendental Meditation is good for the heart, according to a new study. The study was funded by the National Institutes of Health. It found that African-Americans with heart disease who regularly practiced TM reduced their risk of death, heart attack, and stroke by 48%. Researcher Robert Schneider, MD, says those results should apply to the general population. Schneider is director of the Institute for Natural Medicine and Prevention at the Maharishi University of Management (MUM) in Fairfield, Iowa. TM is a trademarked form of meditation. It requires training by a certified teacher to “settle inward” to a place called “transcendental consciousness.” The technique is one of the two pillars underlying education at the Maharishi University of Management, according to the school’s web site. The study was a collaboration between MUM and the Medical College of Wisconsin in Milwaukee. Researchers recruited 201 African-American men and women whose average age was 59 and who were generally considered obese. All of the participants previously had been diagnosed with heart disease. Many of them were current smokers. African-Americans, says Schneider, have a 35% higher risk of dying from heart disease than the general population. The people in the study were divided into two groups. While both groups continued to receive standard care and medication for heart disease, the study group attended a seven-step course in TM. The people in that group were then instructed to meditate twice a day for 20 minutes for the duration of the study. Schneider says that the program was standard for TM practitioners and had not been modified for the study. The comparison group received conventional health education. The people in that group were told to spend at least 20 minutes a day on heart-healthy activities. Members of both groups were followed for as long as nine years. In addition to reducing the risk of death, heart attack, and stroke by nearly half, TM also significantly lowered systolic blood pressure, the top number in a blood pressure reading. Anger control and overall anger also improved. Those who entered the study with either high blood pressure or high stress benefited the most from meditation. “What this is saying is that mind-body interventions can have an effect as big as conventional medications, such as statins,” says Schneider. The TM group was expected to meditate 14 times per week. But the researchers found that on average participants only practiced the technique 8.5 times. They would have done well to stick to their instructions. Those who followed the study guidelines more strictly, Schneider says, had even greater benefits. Their risk reduction was 66%. Shapiro, who reviewed the study for WebMD, says that its design appears scientifically rigorous and that its results are likely valid. But he says the study was too small to draw any definite conclusions. Shapiro, who practices a different form of meditation, also says that more needs to be learned about what drives these results. He says the reduction in blood pressure, while significant, is likely not enough to account for all of the study’s positive outcomes. But it is not free. According to the Maharishi Foundation USA’s web site, the seven-part introductory TM course that the study participants attended costs $1,500. Financial aid and sliding scale fees are available to those who can’t afford the full amount. To Schneider, this study shows that TM is a cost-effective means of prevention. “This is the strongest study ever done on meditation or any mind-body intervention for cardiovascular disease,” he says. In July 2011, the study was pulled from publication in Archives of Internal Medicine, a last-minute decision made when one of the journal’s reviewers raised questions about the data. Schneider says that in the intervening time, the data was re-analyzed. Also, new data was added and the study underwent an independent review. “This is the new and improved version,” Schneider says. It appears in the current issue of Circulation: Cardiovascular Quality and Outcomes. Note: Check November 20 when the next issue comes out in print: http://circoutcomes.ahajournals.org. Twice-a-day Transcendental Meditation helped African Americans with heart disease reduce risk of death, heart attack and stroke. Meditation helped patients lower their blood pressure, stress and anger compared with patients who attended a health education class. Regular Transcendental Meditation may improve long-term heart health. DALLAS, Nov. 13, 2012 — African Americans with heart disease who practiced Transcendental Meditation regularly were 48 percent less likely to have a heart attack, stroke or die from all causes compared with African Americans who attended a health education class over more than five years, according to new research published in the American Heart Association journal Circulation: Cardiovascular Quality and Outcomes. There were 52 primary end point events, which included death, heart attack or stroke. Of these, 20 events occurred in the meditation group and 32 in the health education group. 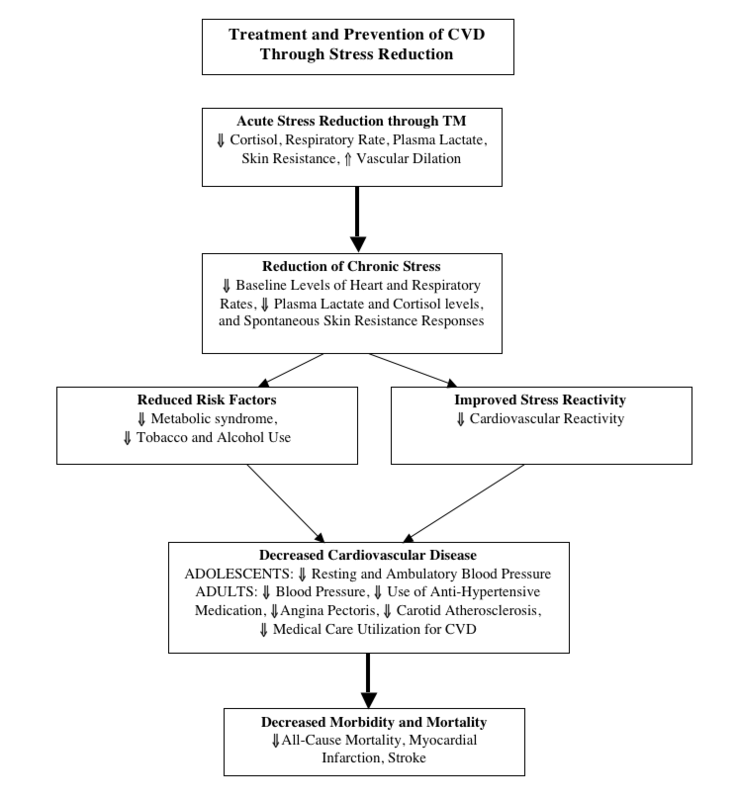 “The research on Transcendental Meditation and cardiovascular disease is established well enough that physicians may safely and routinely prescribe stress reduction for their patients with this easy to implement, standardized and practical program,”he said. Co-authors are: Theodore Kotchen, M.D. ; John W. Salerno, Ph.D.; Clarence E. Grim, M.D. ; Sanford I. Nidich, Ed.D. ; Jane Morley Kotchen, M.D., M.P.H. ; Maxwell V. Rainforth, Ph.D.; Carolyn Gaylord-King, Ph.D.; and Charles N. Alexander, Ph.D. Author disclosures are available on the manuscript. And many major articles around the world, including reports by CNN, CBS, ABC, and NBC. I also included a review of some of the global news coverage and the report in our university paper the Review: New Study Shows Reduced Mortality, Heart Attack, Stroke (Vol. 28, #6, November 28, 2012). You can also read it in this news post: Results of American Heart Association publishing landmark TM study.